Hundreds of years ago, fitness wasn’t a term that existed. However, in today’s age of instant gratification, sugary food, fast food, and sitting on the crouch “Netflix-ing”, fitness is becoming a more and more urgent problem. When it comes to fitness, what most people do not understand is that 80 percent of the formula is mind-set, and only 20 percent is the mechanics/strategies. Look, losing weight and getting fit isn’t rocket science. The formula is as simple as eat less, move more. Why is it that something so simple is so highly disregarded in today’s society? Health and fitness are truly the cornerstones of our life. Imagine this: Health is number one. For every other thing that is important to you, add a zero behind the one...these are your Rolexes, mansions, Gucci shoes, LV bags, Lamborghinis, etc. You’ve now added enough zeroes, and you’re now a billionaire. Great! Now, take out the one, and what do you have now? Nothing left. Without the one thing that matters the most, your health that is, nothing else truly matters. One of the first things I liked about this book was the advice to not exercise if ill. I’ve listen too many other fitness quotes who do not encourage people to listen to what their body tells them, or their doctor. This began with sound advice. I loved the chart that was provided to be downloaded. I copied it to my diary, and I will make the most of it. All of the motivational information was excellent, as was the advice about sticking to a plan long enough for it to have effect. Im a big fan of his book workout for beginner, because it shows me that i can do it, i just need to go progressively, to be patient and stick to it! in this new book, he develops the same ideas about how to do all that, with a real plan, it's great. thank you to be easy to listen, straight forward and honest really. 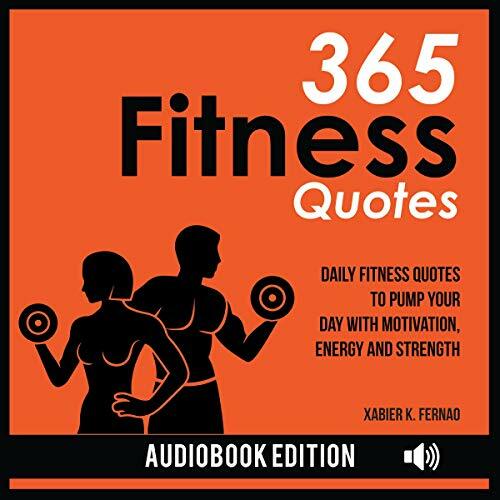 The quotes of this book is to show us how to achieve fitness success, so we are able to get out there and act without any excuses, and attain our fitness goals. Xabier builds on his own personal experience of twenty years, and illustrates how we can develop the mindset required in the health and fitness arena. Fitness & Motivation begins with a bang as it opens on a classic demotivating day - cold, grey and rainy. It’s the type of day that is so dreary that it can easily make you want to stay, if not in bed, at least indoors. But that isn’t where the book takes you, instead it shows you what you can and will do if you want to succeed at getting fit. If you set physical fitness goals and have a hard time achieving them, like me, this is a most listen. It taught me how to obtain a mindset to help me stay motivated so I could remain on track to achieving my physical fitness goals. I learned some invaluable strategies for maintaining a healthy lifestyle. Highly recommended! This book is written for men, by Xabier K. Fernao . A comprehensive,motivation, energy, and strength , detailed book about men's relationship with pump day and fitness. If you're a man with a belly, it's must listen. This is a great book. I've appreciated the author's straight-forward, practical approach to fitness in his previous books and this one doesn't disappoint. He does a great job of describing the proper mindset and attitude it takes to be successful in achieving one's fitness goals, giving true-life examples along the way. Refuel is far and away the best book about Fitness Quotes - I've ever come across. Xabier K. Fernao approach centers on men and what we need to maintain a balanced, healthy, and active lifestyle. He is on a crusade to change the way men eat, the way they exercise, and the way they approach life.Fitness Quotes is obviously part of that, . Not everyone is a chef like Xabier K. Fernao makes practical Fitness Quotes. There is no question following his approach will deliver results. There is nothing faddish or short-term recommended, but it is relatively simple to adopt this holistic approach and retain vigor, youth, and great health throughout your life. It's really a masterpiece in its field. This was a great listen and was more than I expected. The quotes of the authors past are entertaining and they all have a valuable message. It is nice to see how these past experiences have shaped his future in the health and fitness industry. I have been looking for and all-inclusive book to recommend to my clients as an additional resource to help them succeed with their physical goals. This book is it! I love how Xabier K. Fernao Puma speaks the truth. I highly recommend this book. I got this thinking that it would be a quick guide and some easy quotes for staying motivated, but after listening the first few chapters, I realised that it had a lot more depth than that. The book has some great quotes from the authors past that have valuable lessons. The latest on fitness from fitness guru Xabier, is a surprise in that it’s not so much about fitness as it is about Fitness Quotes. He doesn’t pull any punches as, with touches of humor, he leads us along the path of mental training, the key to success. Being a fitness enthusiast myself, i find the concepts in this book resounding. Although they may hit you as somewhat commonsense, you may or may not have realize it enough to put into context of your workout. This has all the great stuff for a man to get his body mind and soul together. It has so much info that it will give you what you need to start a new life for your body. Could the answer to the health crisis for most men be delicious? And simple? And boost testosterone?! The thing I love about Xabier K. Fernao is that he is legit. He is a practicing , so his advice and counsel is from years healing people .Seriously, are you ready to refuel? Great job Xabier K. Fernao .